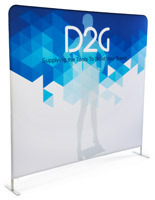 This trade show booth backdrop will draw attention as it stands 84”, or 7 feet tall. 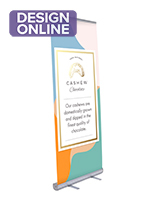 Have your company’s logos displayed prominently at your next industry event, thanks to the double sided, full color graphic printing that is offered with this banner stand. 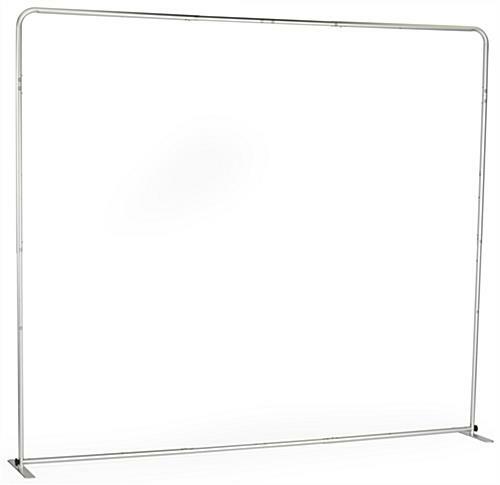 Transporting and assembling your exhibit is simple, with the click-into-place aluminum framing. 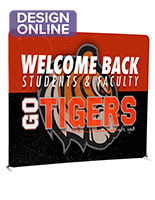 Each lightweight booth backdrop includes a nylon carrying case for portability. 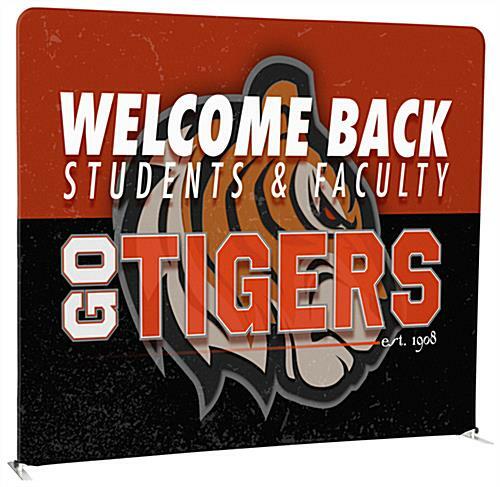 Use the art templates provided to upload your custom graphics which are printed onto poly flex fabric using a dye sublimation process. When you use a booth backdrop as large as this at industry events, your exhibit will be hard to miss and will garner the attention you desire. 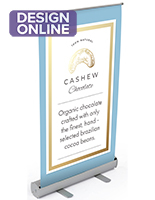 Although marketed as a floor standing banner stand, this kit also includes two small aluminum clamps for tabletop mounting. 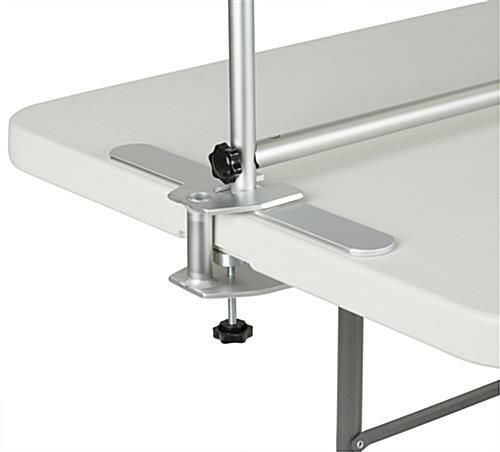 Please Note: The base aluminum frame of this product can be used for many different applications (including as a floor-standing backdrop/ tabletop header) and adjusts to either 6' or 8' wide. 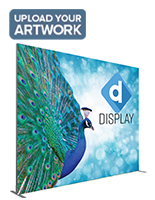 Purchase a single frame and buy the appropriate replacement graphics to get the most of this versatile product! 96.0" x 84.5" x 14.5"
43.0" x 5.0" x 16.0"
I didn't know what to expect, as this was my first time ordering something for a trade show booth. The frame comes with clear instructions and is fairly easy to assemble. 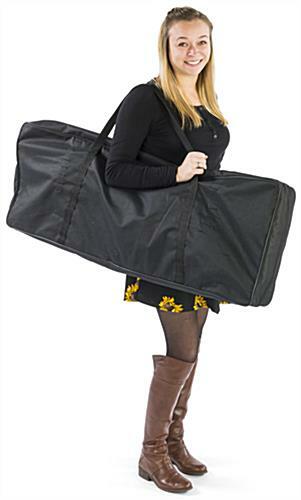 You will need two people to get the fabric on/off of the frame. 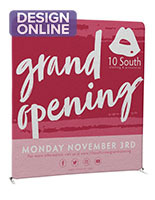 The fabric is a nice quality and our graphic looks awesome on it. You will also need help getting the zipper closed at the bottom because the fabric needs to be stretched tight enough and for that you will need four hands. It's great that this is double-sided. In our most recent trade show, the food and table for attendees was behind the trade show area. It was nice that they saw our backdrop while they were sitting down eating. Overall, I highly recommend this product. 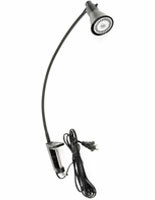 Especially if you are a small business looking to present a professional look at a tradeshow. 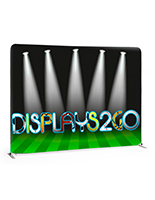 Displays2Go was also so easy to work with and highly responsive to emails during the approval process. Thank you! We are happy to hear about your recent positive experience Kathleen, thanks for your business!